Huge Savings Item! 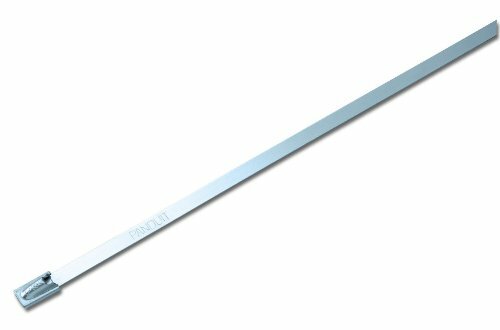 Save 15% on the Panduit MLT2S-CP Pan-Steel Self-Locking Cable Tie, General Purpose, Standard Cross Section, AISI 304 Stainless Steel, 2.0'' Max Bundle Diameter, 0.50'' Min Bundle Diameter, 200lbs Min Tensile Strength, 0.010'' Thickness, 0.18'' Width, 7.9'' Length (Pack of 100 by Panduit at Defy Now. MPN: MLT2S-CP. Hurry! Limited time offer. Offer valid only while supplies last. This Panduit MLT2S-CP cable tie is made of stainless steel 304, has a minimum tensile strength of 200 lb., and a maximum bundling diameter of 2.0''. This Panduit MLT2S-CP cable tie is made of stainless steel 304, has a minimum tensile strength of 200 lb., and a maximum bundling diameter of 2.0". The cable tie uses a stainless steel locking pawl for closure. This cable tie is Underwriters Laboratories (UL) Listed for quality assurance and is suitable for securing and bundling electrical cables in corrosive environments.